Pleased bring the following supplies to your new owner's class for a computerized sewing machine. Please bring the following supplies to your new owner's class for an embroidery machine. 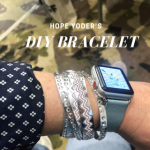 Learn to turn RNK Deco Magic, hot fix crystals and heat transfer foil into a perfectly beautiful wrap bracelet. Dust off that serger-or take it out of the box-and put it to use. Don't let a machine get the better of you! Brother Luminaire/ Baby lock Solaris New Owners classes are meant to supplement your one-on-one owner's lasses. ?They are in a lecture/demo format, so you do not have to bring your machine.? They are free if you purchased your machine from Denton Sewing Center.? Create a beautiful pillow and learn new techniques on your serger: flatlocking, ruffling, rolled hemming, ruching, piping, inserting a zipper, and embellishing with embroidery, beads, cords and ribbons! This project teaches a wealth of serger skills. You can never have too many bags! This colorful, large bag has a large zippered opening and a zippered pocket on the back. The front has an inset for vinyl, cork, or Kraft-Tex paper. What fun! Embroidery sizes 6x10 or 8x12. Pattern CD purchase required. Craft n Cut is the perfect software match for your fabric & vinyl cutting machines! So lets learn to get around in the software and start to make things happen! Embellish Maker is a marvel. In the software, you can create amazing embroidery embellishments. And it?s sooooo easy! Join us to learn more about getting around the Embellish work space and learn to make things happen! Create a treasure in burlap while learning the secrets to embroidering on this rustic, open weave fabric. For a fun addition to your summer family get-togethers, try these seasonal flatware holders. They are easy and fun to make, with in the hoop background quilting and a seasonal design. They make great gifts, too. Trapunto is a 3-dimensional quilting technique that never fails to catch the eye. Shadow Trapunto is even more alluring. In class, this dimensional quilting technique takes a novel twist. In class, we?ll investigate New Assets, remove overlap in appliqu?, the exciting Random Stipple and the implications of the Closed Slice Tool. For fun, we?ll experiment with Color Play, Font Play, the Distortion tool and the Mesh Fill. 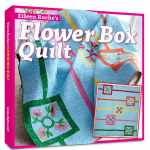 Eileen Roche?s?Flower Box Quilt?teaches an interesting method for embroidering complex design layouts involving multiple embroideries and quilted areas. We?ll be following Eileen?s method in this three session class to create a festive table runner. This is a great opportunity! Once you understand Eileen's method for?designing complex layouts, you can easily adapt the method to make your own creations. The Flower Box Quilt Table Runner class is an excellent opportunity to practice methods for successfully embroidering complex layouts. If you are interested in the class, but have questions - orientation is the time and place. Spanish hemstitching, also known as bridging. is a beautiful heirloom technique that resembles drawn thread work. Join the Sisterhood - Hoop Sisters 10th Anniversary in-the-hoop quilt. Quilt can be made using a hoop as small as 5 inches. Wait until you try this! EASY to finish in-the-hoop coasters that look as good on the front as the back.? Finished coaster size is 4 inches square.? Coasters use Deco Magic Dimensional Embroidery Foam for added texture and structure.? Embellish thread friendly. Join us for a new embroidery experience! Due to popular demand, the ITH zipper purse with cork panel is now available as a class. Do you have a young sewer-want-to-be in your life? Get her (or him) off on the right foot. Let us teach them how to sew. Kids 9 and up only, please. This project is a legitimate excuse for giving yourself a sew day and stitching the Grateful Heart Composition Book for everyone you love. 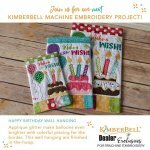 A layer cake with icing, candles, confetti, and now Kimberbell?all become part of your birthday wishes! We used applique glitter to make the balloons even brighter and colorful piecing for the border. This adorable wall hanging can be made in three sizes and has all the features we love about quilting, except the work is finished in-the-hoop on an embroidery machine. The combination of a simple patchwork strip with contemporary techniques like quilting in-the-hoop, gives this zipper pouch a subtle sophistication in all four sizes. There are two definitions for the word sage. One meaning wisdom and good judgment, as in sage advice. The other, a savory culinary herb popular in meat and poultry dishes. Take our advice and serve up a spicy dish for your family with these adorable owl oven mitts. In three sizes, for holding saucepan handles to a cast iron skillet, your fingers fit just inside the wings. We?ve stitched our owls with flannel and recommend a layer of insulated lining like Insul-Bright? , and batting for use as a hot pad or oven mitt. Where you can have your cake and stitch it too! Registration fee is $225.00 or $22.00 per month includes attendance for class sessions. The original Convergence Quilt features two or more fabrics that are cut into squares, sewn together, cut into strips and merged together twice. Tims recommends that each Convergence Quilt be thought of as a Mystery Quilt - no rules, just guidelines. Whatever you call it, the Convergence Quilt is exciting and fun. Kraft Tex lends itself to minimalism - exposed seams and simple geometric lines. This makes it the perfect canvas for embellishment. This class is twofold: first we'll cut and emboss the wallet pieces on the Brother Scan n Cut. Then we'll assemble and sew the wallet. The wallet itself is a simple bi-fold with pockets for cards and ID; a zipper compartment; a section for bills and a tucked lapped closure. All the fun a creative person could ask for! Can't find time to sew? Come Sit and Sew in our classroom. Work on your sewing or embroidery projects and enjoy a time of fellowship, sharing and creating new friendships. Fee is $10. We provide a meal and beverage. Snacks and dessert are always welcome. Stitcher's Garden One is open to all ages, levels of sewing experience and machines. This is a great class for learning a new machine. Every technique you learn can be used in garment construction or home decor as well as quilting.class is for BEGINNERS as well as the experienced sewer. A great mother/ daughter class to take for bonding. This will be an ongoing class so you can start in ANY month and keep going till complete. You can miss a month and pick up the block on the next run or at a Denton Sewing Center Sit and Sew (every other Friday evening - check the schedule). The Poppins Bag is a large (18? wide by 12? deep by 14? tall) zipper top bag to hold all your ?magical? stuff. Perfect for carrying sewing notions and fabric to class. Two pockets on the outside are the perfect canvas for an accent embroidery or fabric panel. Thread Velvet is a term coined by Husqvarna Viking that describes the outstanding feature of their unique 3-dimensional embroidery designs. Thread Velvet is also a digitizing technique that produces designs with surfaces so velvety you can?t help touching them. This class is structured to guide you through the creation of these unique designs. If you?ve never taken advantage of the Puffy Foam capability of this software, you are missing out. Learn all about using puffy foam to create dimension in your letters.